I mentioned a couple weeks ago that I would be starting a new weekly feature showcasing beautiful but easy scrapbook pages. I'm FINALLY getting started with this and I apologize for taking so long to get it going. Many of you mentioned that you'd love to scrapbook but there are things that tend to hold you back. There are a few certain key reasons that I hear over and over again that you hold back. 1. You don't have enough time. 2. You don't feel like you have enough "stuff" to make pages worth looking at. 3. You can never think of ideas on your own and feel like you can't get started on your own. 4. You feel intimidated looking at all the gorgeous pages you see online and in magazines. Well, I'm here to tell you that this feature will help you overcome ALL of those reasons. First off, I aim to show you how to create pages in roughly 30-40 minutes. Secondly, I want to show you just how easy it is to create beautiful pages with minimal supplies and I'll show you the creative process I used to create those pages. Thirdly, I'm here to give you ideas, sketches and challenges that will help to jump start your creativity. Fourthly, with the three things above that I'm helping you with, they should take care of overcoming that intimidation you feel. To make this even more fun, I'm going to put forth a challenge each week to go along with the page I've shown you. You'll have a few days to create your own page and send me a picture to upload on my blog. I'll create a separate blog page with the pages you submit for the challenge and then everyone can vote on a winning page (names will be withheld during the voting). The winner will receive a prize from me at the end of the voting period! The biggest prize, though, will be that you're scrapping your precious photos and memories and that's PRICELESS! So, with saying all of that, let's get started with this week's page and challenge. For this week, I decided to start out with a supply challenge to myself and to all of you. For this challenge, I limited myself to a list of 6 things that I could use on my page. I'm putting this challenge forth to you as well. 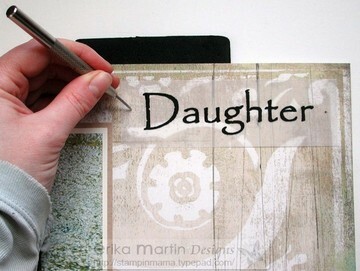 I chose to create my scrapbook page on the patterned cardstock as my base. I chose a sheet of cardstock from the Motifica collection from Basic Grey. I wanted something patterned so that it could carry most of the design, since I was limiting myself to only 6 supplies. I went with something understated so that it wouldn't take away from the picture or the journaling. Just for clarification, I'm almost exclusively a 12 x 12 inch scrapbooker, though this challenge and layout could certainly be translated to any size of page that you're working with. I chose Very Vanilla for my neutral cardstock and this was what I matted my photo on first. I then matted this on top of my colored sheet of cardstock. I chose a light brown cardstock for this. My patterned paper was chosen because it was understated and pulled some of the earthy colors inthe photo I chose to use on this page. I chose my neutral color according to the swirls in the patterned cardstock. I chose the colored cardstock according to some of the brown hues in the patterned cardstock. 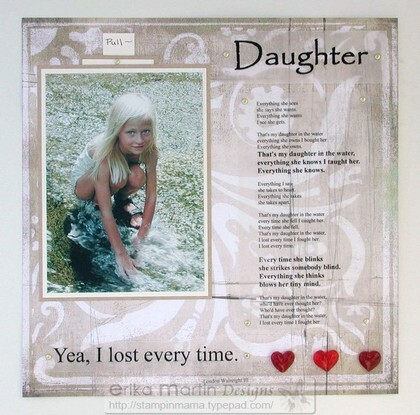 I used to be a "chronological scrapbooker" but found that I got myself in a rut that way. There were so many pictures that I wanted to work with but felt like I couldn't because they didn't fall in order with what I was currently working on. About 7 years ago, I went through almost a year without scrapbooking at all because I was so tired of feeling hemmed in to scrapbooking in a chronological way. I wanted to work on whatever I wanted to and felt like I couldn't do that. I remember reading an article in a scrapbooking magazine that encouraged us to think outside the chronological box and work on whatever we wanted to. To enjoy the flexibility of this art form and to fully express ourselves by not creating rules for ourselves. 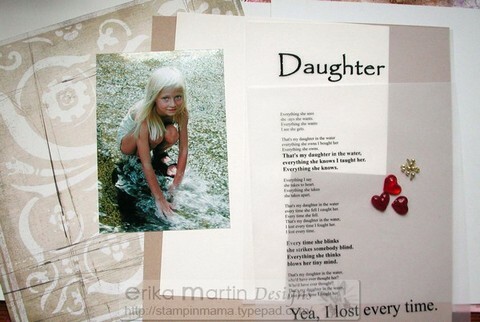 That's when I found my love of scrapbooking all over again. Now, I scrapbook what I want, when I want. I feel so much more freedom in my scrapping when I scrap like this. One thing that I've taken to using a lot of on my pages is 5 x 7 inch photos. It really helps to bring out a focal point on my page. When using multiple pictures, it helps to bring one focal photo to attention. Sometimes, though, I want to create a page centering around one picture. I love the look of the larger 5 x 7 inch photo (as opposed to a 4 x 6 photo). It helps to fill up a larger portion of the page and really focuses on your photo as the "main star" of the page. I chose a 5 x 7 inch photo of my daughter playing in the creek just down the road from our house. I mounted my picture in the top left corner of my patterned cardstock. Because I wanted to hide some journaling behind the photo, I only applied adhesive to the bottom and two sides of the photo mat. The top edge of the picture acts as a sleeve to fit my journaling into. Because I only used part of the brown and vanilla cardstock for matting my photo on, I had plenty left to cut a small journaling block to hide behind my photo. I cut the Very Vanilla at 2 1/4 x 3 1/4 inches and then mounted it on top of a piece of brown cardstock cut at 2 1/2 x 3 1/2 inches. For both the journaling block and my photo, I allowed an extra 1/4 inch for my bottom cardstock layers to create a 1/8 inch border. I cut a small piece of vanilla cardstock and attached it to the top of my journaling block with a mini gold brad and then wrote "Pull" at the top. This created a "pull tab" at the top of my journaling block. I then journaled on this and slid it behind the photo. 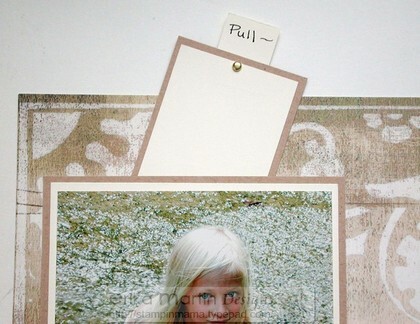 The brad stops at the edge of the photo and keeps the journaling block from sliding behind the photo. I wanted to include the lyrics of a song that has quickly become a favorite of mine. Because there were a lot of words to include, I chose to print them off with the computer. I didn't want to hide the beautiful designs of the patterned cardstock, so I opted to use vellum. I printed out the words from the song, "Daughter," by Loudon Wainright III using Papyrus font for the title and Times New Roman font for the lyrics. I enlarged the font and bolded the parts that really stuck out to me in the song. Since it would take up quite a bit of room for the lyrics, you can check them out here: ---> "Daughter" lyrics You can probably also read them on the page if you click on the full picture of this page at the top of this post. I had just gotten this photo printed off and as soon as I heard this song, I knew it would be perfect to go with these lyrics. I used my paper cutter to trim the title, lyrics and last line of the lyrics separately. I've yet to find a completely invisible vellum adhesive, so I like to attach my vellum to my projects using things like eyelets and brads. Because my smallest hole punch will only stretch so far, I like to use my paper piercing tool and mat from my Crafters' Tool Kit to make my holes. They're the perfect size for mini brads. So, I used a brad for the pull tab on my journaling block, but I also used them to anchor my pieces of vellum down to my cardstock. The brads serve dual purposes. They serve a practical purpose by holding down my vellum without having unsightly adhesive blotches showing through. They also serve the purpose of adding embellishment to my page in a non-overwhelming way. There's a lot going on with a big photo, the swirling pattern of the cardstock, all of the heavy journaling/lyrics so I didn't want to use something that was going to compete with all of those things. The mini brads were a great touch. Because vellum can tend to "sag" a little bit if it's not anchored down in the middle (and only held on by the corners), I wanted to give it a little more stability. I turned the pieces of vellum over and applied small bits of adhesive to the backs of some of the journaling and the title. I chose places that were heavy with ink, like the bolded parts in the song lyrics and behind the lines of the large title. Using a tape runner (like the SNAIL Adhesive) allows you to apply VERY small bits of adhesive, so they're completely hidden and won't leave dark spots that you'll see once it's stuck down to the cardstock. I chose one more embellishment for my list of 6 supplies. 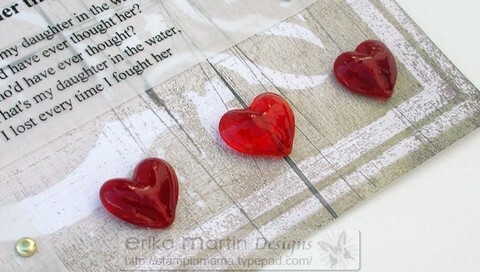 These are little glass hearts that I found years ago in the mosaic section of Michael's. They add a little dimension (and a slight amount of bulk) to the page, but they add just a touch of color and show, in a visual sense, that even though life is unpredictable with my daughter, I love that girl child to pieces! This page only took me 30 minutes to create and only uses 6 supplies but yet it's a beautiful page (if I do say so myself- *wink*). See? You CAN do this! Use the following 6 supplies (just like I did) to create a page. It can be any size you like. When you've completed your page, take a well lit picture (you don't have to be a professional photographer to do this....here's some tips on how I take mine: FAQs about my photos) and email it to me at erikaerin2001@yahoo.com by Thursday (March 27th) at 7 pm Eastern time. Voting will start that night and run till 9 pm Sunday night (3/30). I'll announce the winner and the prize Sunday night before midnight. If there's something you'd like to see as a scrapbooking challenge, definitely let me know and I'll see what I can do to incorporate it into this feature. I'll also be offering sketch chellenges, as well, in future posts.